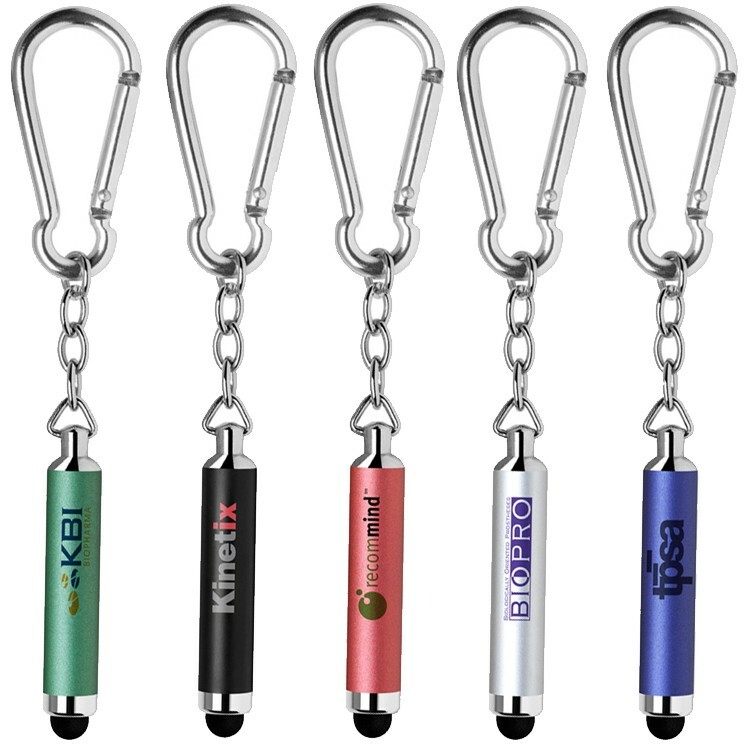 Run Stylus Tool Mini soft-touch stylus Metallic Finish for Extra Class 3" long convenient lightweight aluminum body 1.5" earphone jack adapter - Just Plug It In Function design includes a capacitive soft touch stylus fully compatible with iPad, iPhone, iTouch, and all other touch screens Laser Engraves in Matte Silver Packed in a Free Gift Box ( No Imprint ) Imprint on Gift Box Add $0.25 (v) plus Setup ( See KP323 for Similar Item ) Price includes one color/ position Silk Screen or Laser Engraving - Lasers in Matte Silver Comes in Gold, Blue, Black, Red, Chrome Each Stylus Comes in Gift Box Imprint Area: Silkscreen: 1-1/8” H x 1-1/2” W Engraving: 1/4” H x 1-1/2” W FOB: 92821 500 pcs / 14 lbs. 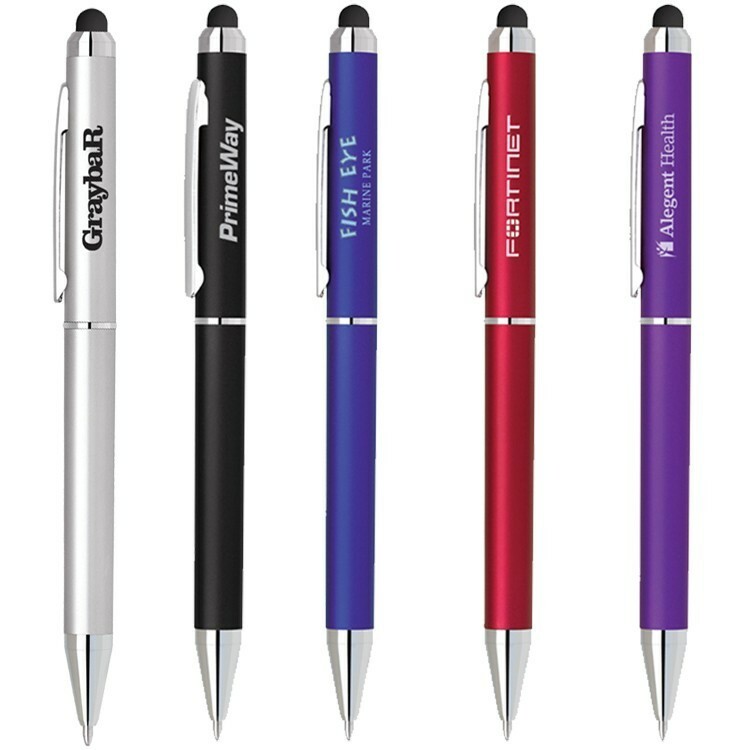 Sharp Stylus Tool with Twist Ballpoint Pen Anodize Colored Twist Action Ballpoint Pen and Capacitive Stylus 2-in-1 Ballpoint Stylus Chrome Stripped Grip with Shining Accents Function design includes a capacitive soft touch stylus fully compatible with iPad, iPhone, iTouch, and all other touch screens Laser Engraves in Silver Packed in a Free Gift Box ( No Imprint ) Imprint on Gift Box Add $0.25 (v) plus Setup Price includes one color/ position Silk Screen or Laser Engraving - Lasers in Silver Comes in Hot Pink, Gun Metal, Satin Chrome, Blue Each Stylus Comes in Gift Box Black ink standard. 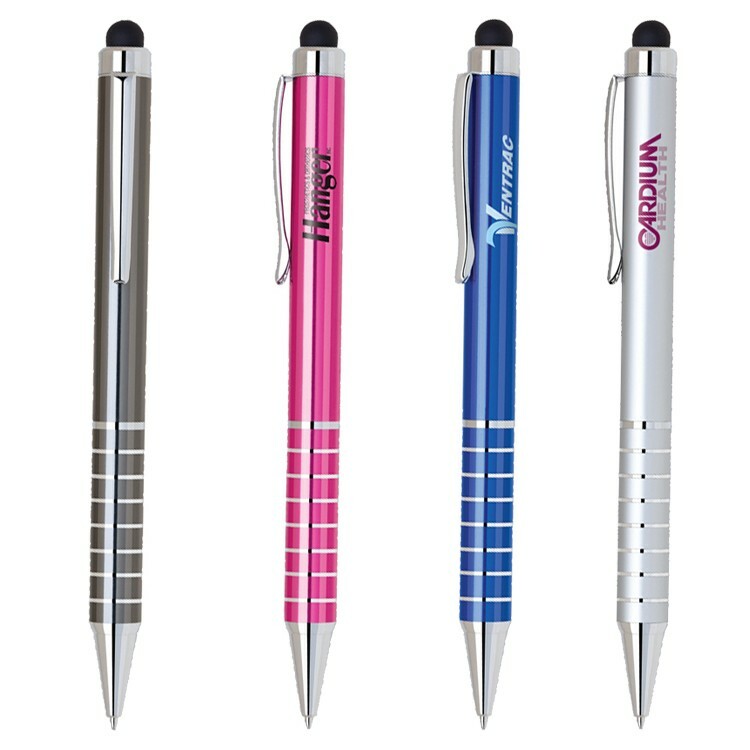 Switch to Blue Ink add $0.10(v) Imprint Area: Silkscreen: 1” H x 2” W Engraving: 9/32” H x 2” W FOB: 92821 500 pcs / 25 lbs. 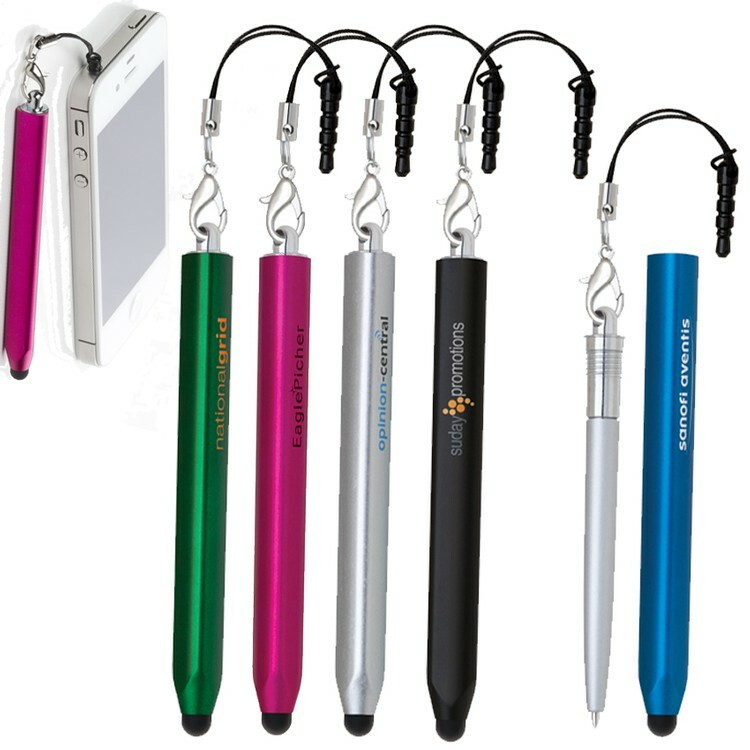 Log Stylus Tool with Pen and Earphone Jack Adapter 2 in 1 Twist Off Action Plastic Pen With Capacitive Soft-Touch Stylus Triangular Body in Bright Color 1.5" earphone jack adapter - Just Plug It In Function design includes a capacitive soft touch stylus fully compatible with iPad, iPhone, iTouch, and all other touch screens Packed in a Free Gift Box ( No Imprint ) Imprint on Gift Box Add $0.25 (v) plus Setup ( See KP323 for Similar Item ) Price includes one color/ position Pad Print Comes in Silver, Black, Green, Blue, Hot Pink Each Stylus Comes in Gift Box Imprint Area: 7/32" H x 1-3/4" W (Barrel) 3/16" H x 1-3/16" W (Pen) FOB: 92821 500 pcs / 11 lbs. 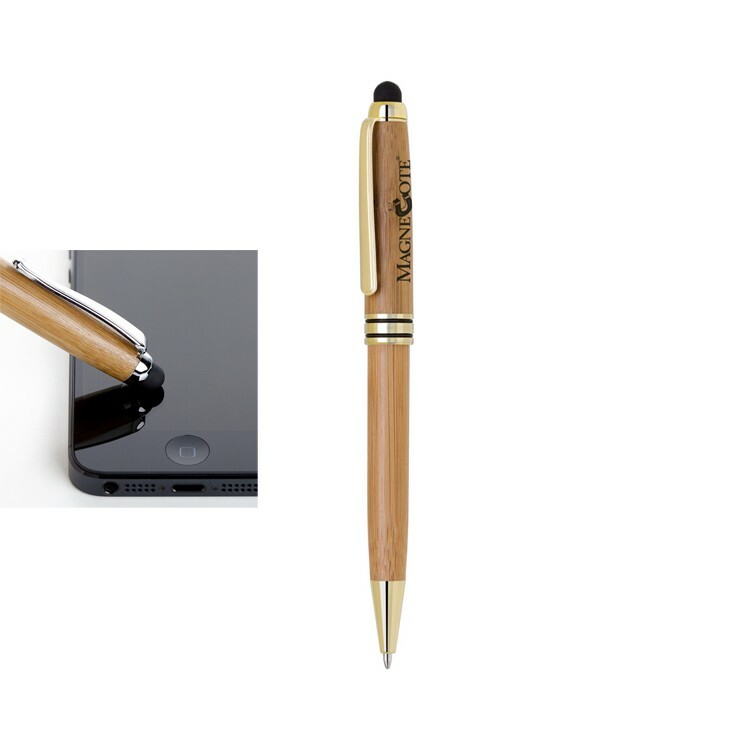 Eco V Stylus Tool with Bamboo Ballpoint Pen Eco-Friendly - Green Product Bamboo Made Pen with Gold Accents Twist Action Pen 2-in-1 Ballpoint Stylus Function design includes a capacitive soft touch stylus fully compatible with iPad, iPhone, iTouch, and all other touch screens Packed in a Free Gift Box ( No Imprint ) Imprint on Gift Box Add $0.25 (v) plus Setup Matching Pencil - KP342 Pen / Pencil Setup KP345 Price includes one color/ position Silk Screen, Pad Print, Laser Engraving Additional Silkscreen Position and/or Color Running Charge: $0.25 (v) Additional Laser Engraving Position Running Charge: $0.35 (v) $0.20(v) to upgrade from ballpoint to Gel Ink, available in Black or Blue ink Comes in Bamboo with Gold Each Stylus Comes in Gift Box Imprint Area: Silkscreen: 1” H x 1-1/8” W (Cap) 1-1/8” H x 1-3/8” W (Barrel) Pad Imprint: 5/16” H x 1-1/8” W (Cap) 5/16” H x 1-3/8” W (Barrel) Engraving: 5/16” h x 1-1/8” w (Cap) 5/16” H x 1-3/8” W (Barrel) FOB: 92821 500 pcs / 36 lbs. 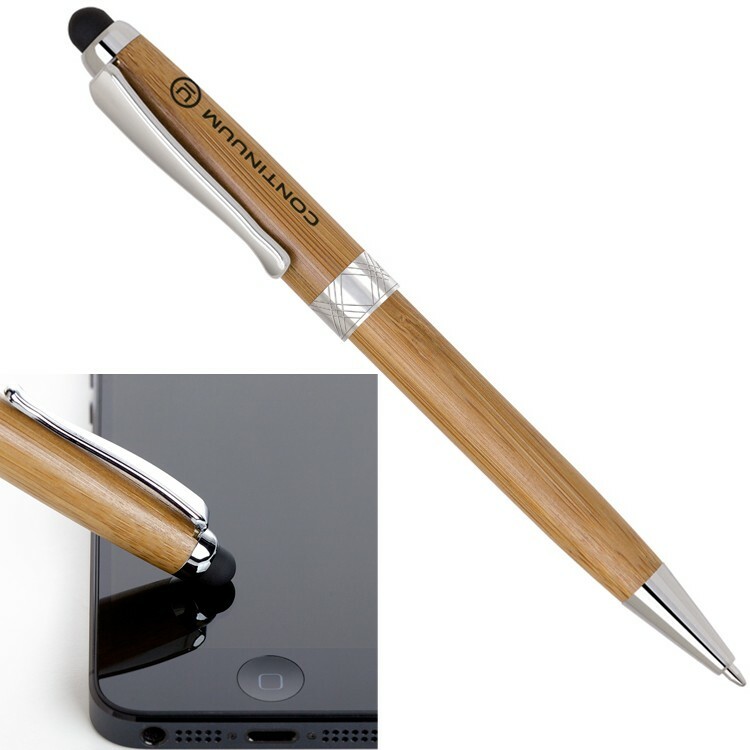 Eco Stylus Tool with Bamboo Ballpoint Pen Eco-Friendly - Green Product Bamboo Made Pen with Chrome Accents Twist Action Pen 2-in-1 Ballpoint Stylus Function design includes a capacitive soft touch stylus fully compatible with iPad, iPhone, iTouch, and all other touch screens Packed in a Free Gift Box ( No Imprint ) Imprint on Gift Box Add $0.25 (v) plus Setup Matching Pencil - KP338 Pen / Pencil Setup KP341 Price includes one color/ position Silk Screen, Pad Print or Laser Engraving Additional Silkscreen Position and/or Color Running Charge: $0.25 (v) Additional Laser Engraving Position Running Charge: $0.35 (v) $0.20(v) to upgrade from ballpoint to Gel Ink, available in Black or Blue ink Comes in Bamboo with Satin Chrome Each Stylus Comes in Gift Box Imprint Area: Silkscreen: 1” H x 1-1/8” W (Cap) 1-1/8” H x 1-3/8” W (Barrel) Pad Imprint: 5/16” H x 1-1/8” W (Cap) 5/16” H x 1-3/8” W (Barrel) Engraving: 5/16” h x 1-1/8” w (Cap) 5/16” H x 1-3/8” W (Barrel) FOB: 92821 500 pcs / 29 lbs. 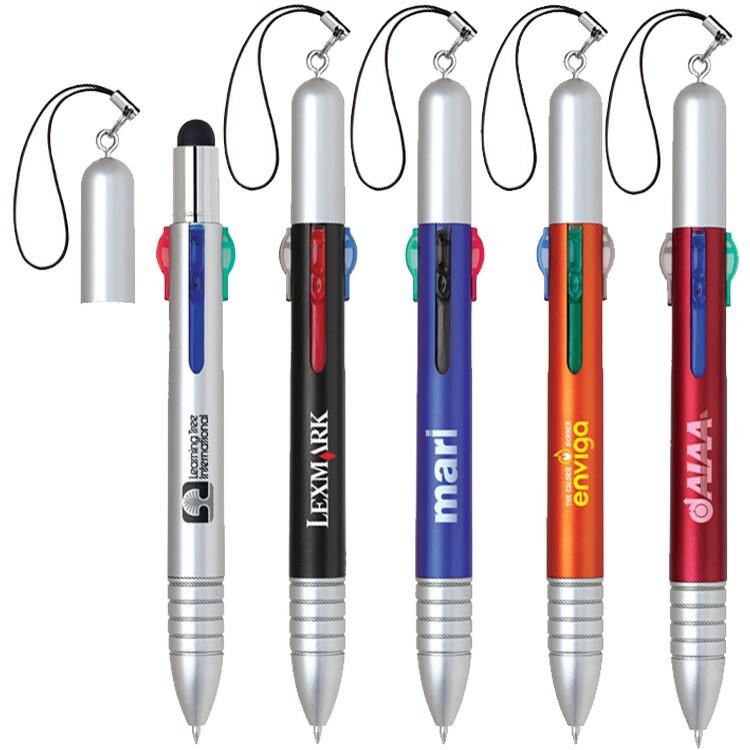 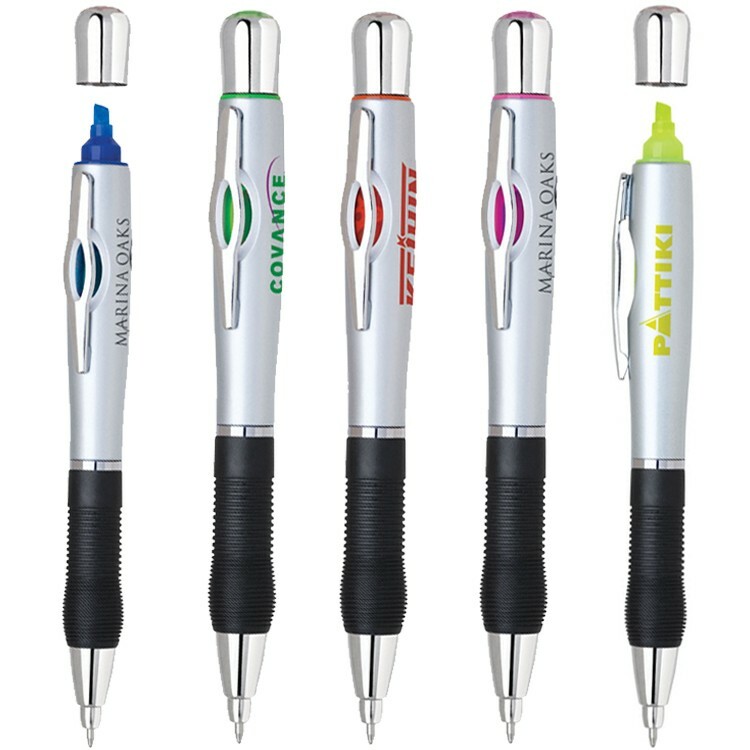 Ocean Stylus with Twist Pen Twist action plastic stylus pen with brightly colored grip and silver coated barrel Function design includes a capacitive soft touch stylus fully compatible with iPad, iPhone, iTouch, and all other touch screens Packed in a Polybag Price includes one color/ position Pad Print Comes in Black, Red, Green, Blue Each pen Stylus Combo comes in Polybag Imprint Area: Pad Imprint: 3/8” H x 1-1/2” W FOB: 92821 500 pcs / 16 lbs. Links Stylus Tool High-Sensitive Conductive Fiber Cloth Material Stylus Function design includes a capacitive soft touch stylus fully compatible with iPad, iPhone, iTouch, and all other touch screens Laser Engraves in Gold Packed in a Free Gift Box ( No Imprint ) Imprint on Gift Box Add $0.25 (v) plus Setup Price includes one color/ position Silk Screen, Pad Print, Laser Engraving - Lasers in Gold Additional Silkscreen/Pad Imprint Position and/or Color: $0.20 (v) Laser Etch in Chrome: $0.25 (v) Additional Laser Engraving Position: $0.30 (v) Oxidization Black Add: $0.25 (v) Comes in Pearl White, Glisten Black, Translucent Blue, Satin Chrome Each Stylus Comes in Gift Box Imprint Area: Silkscreen: 3/4" H x 2-1/8" W Pad Imprint: 1/4" H x 1-3/4" W Engraving: 1/4" H x 2-1/8" W FOB: 92821 500 pcs / 18 lbs. 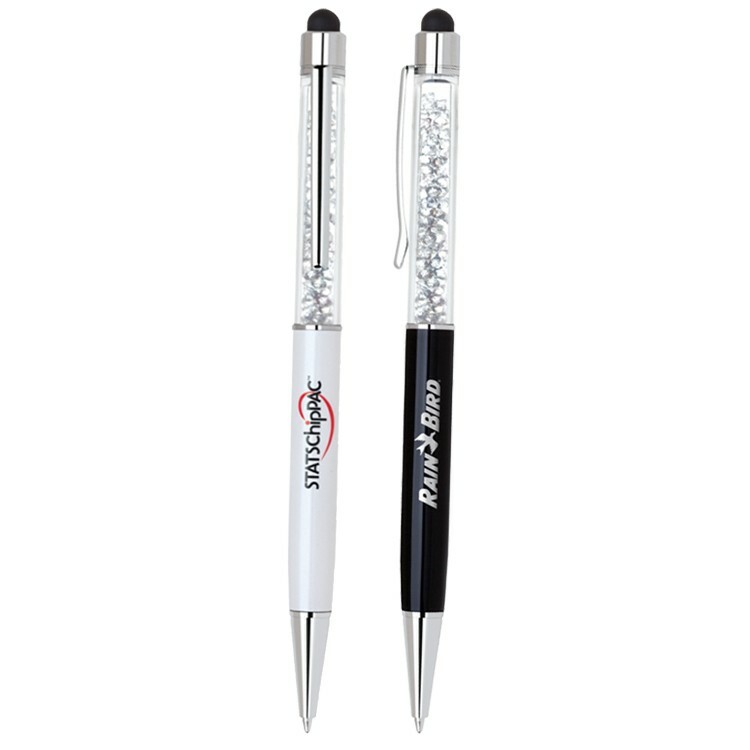 Brook Stylus with Twist Pen Brass constructed twist action ballpoint with capacitive soft-touch stylus Featuring sparkling clear crystal insert in upper barrel ( Diamond Style ) Function design includes a capacitive soft touch stylus fully compatible with iPad, iPhone, iTouch, and all other touch screens Packed in a Free Gift Box ( No Imprint ) Imprint on Gift Box Add $0.25 (v) plus Setup Price includes one color/ position laser engrave or silk screen Laser engraved in Gold Oxidation black & laser chrome are available with additional charge $0.25(v) Comes in Black, White Each pen Stylus Combo comes in Gift Box Oxidation black & laser chrome are available with additional charge $0.25(v) Imprint Area: Silkscreen: 5/16"H x 1-3/8"W (Cap) 1-3/16"H x 1-3/8"W (Barrel) Engraving: 1-3/16"H x 1-3/8"W (Barrel) FOB: 92821 500 pcs / 24 lbs. 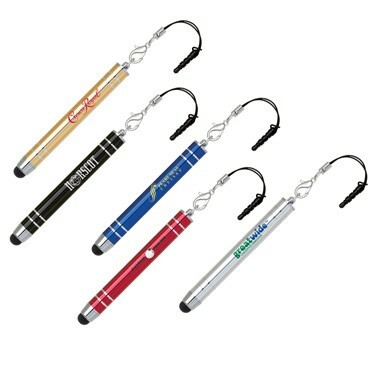 Sky Stylus with Twist Pen Brass constructed twist action ballpoint with capacitive soft-touch stylus Pearl white barrel with colored pro-grip for comfort Function design includes a capacitive soft touch stylus fully compatible with iPad, iPhone, iTouch, and all other touch screens Packed in a Free Gift Box ( No Imprint ) Imprint on Gift Box Add $0.25 (v) plus Setup Price includes one color/ position laser engrave or silk screen Laser engraved in Gold Oxidation black & laser chrome are available with additional charge $0.25(v) Comes in Black, Purple, Red, Green Each pen Stylus Combo comes in Gift Box Oxidation black & laser chrome are available with additional charge $0.25(v) Imprint Area: Silkscreen: 1-1/16” H x 2” W Engraving: 5/16” H x 2” W FOB: 92821 500 pcs / 32 lbs. 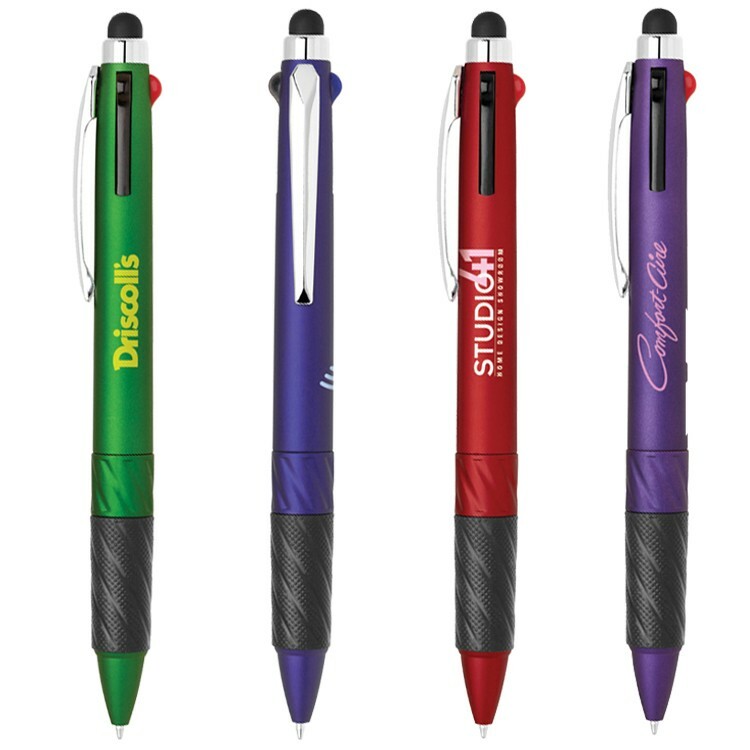 Bank Stylus with Twist Pen Twist action plastic stylus pen in cool colored and chrome accents Function design includes a capacitive soft touch stylus fully compatible with iPad, iPhone, iTouch, and all other touch screens Packed in a Clear Polybag Price includes one color/ position Pad Print Comes in Black, Purple, Blue, Red, Silver Each pen Stylus Combo comes in Polybag Imprint Area: Pad Imprint: 5/16” H x 1 3/4” W Barrel 5/16" H x 1 1/2" W Cap FOB: 92821 500 pcs / 14 lbs. 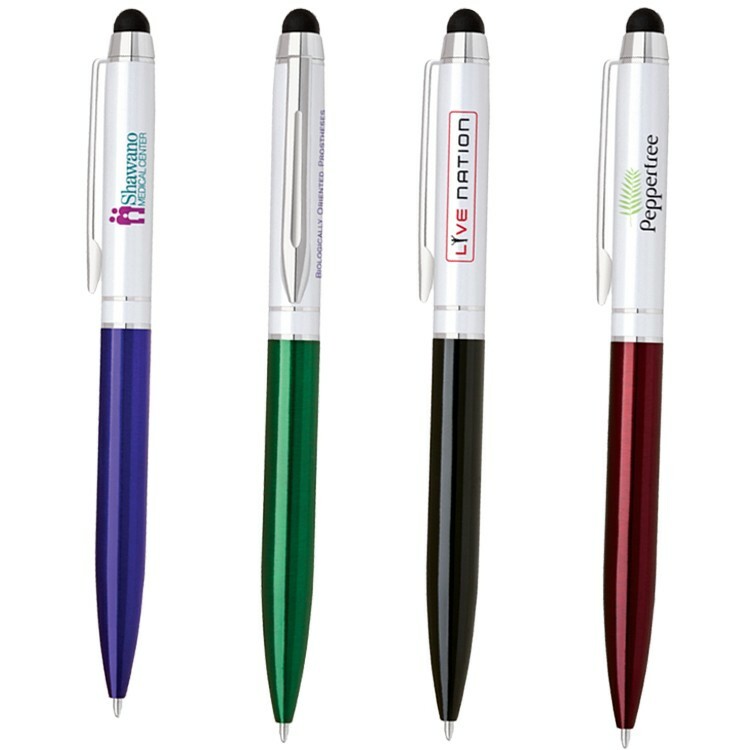 Street Stylus with Pen Aluminum constructed twist action ballpoint with capacitive soft-touch stylus Pearl white cap featuring translucent colored barrel Function design includes a capacitive soft touch stylus fully compatible with iPad, iPhone, iTouch, and all other touch screens Packed in a Free Gift Box ( No Imprint ) Imprint on Gift Box Add $0.25 (v) plus Setup Price includes one color/ position laser engrave or silk screen Laser engraved in Silver Oxidation black & laser chrome are available with additional charge $0.25(v) Comes in Black, Blue, Red, Green Each pen Stylus Combo comes in Gift Box Oxidation black & laser chrome are available with additional charge $0.25(v) Imprint Area: Silkscreen: 7/8"H x 1-5/16"W (Cap) 1-1/8"H x 1-9/16"W (Barrel) Engraving: 9/32"H x 1-5/16"W (Cap) 9/32"H x 1-9/16"W (Barrel) FOB: 92821 500 pcs / 24 lbs. 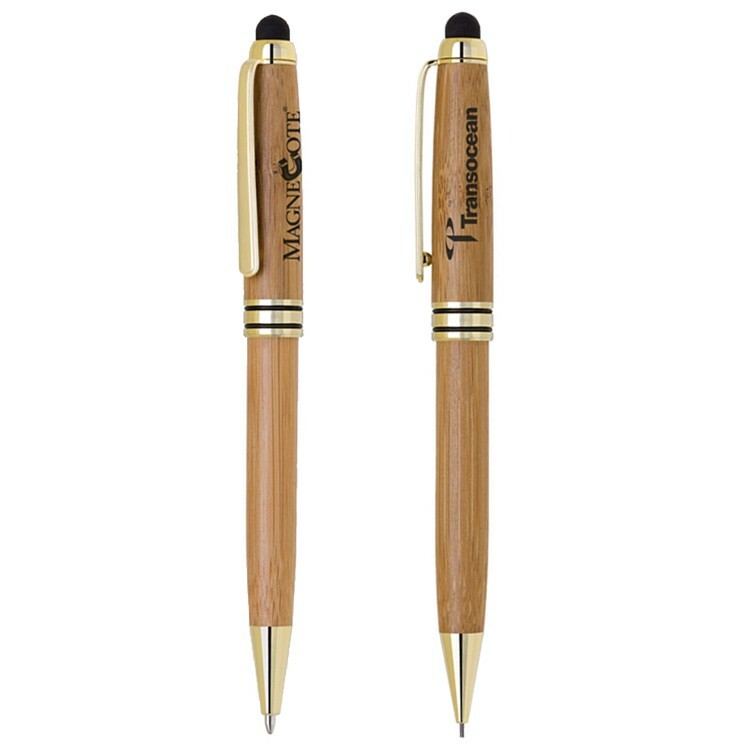 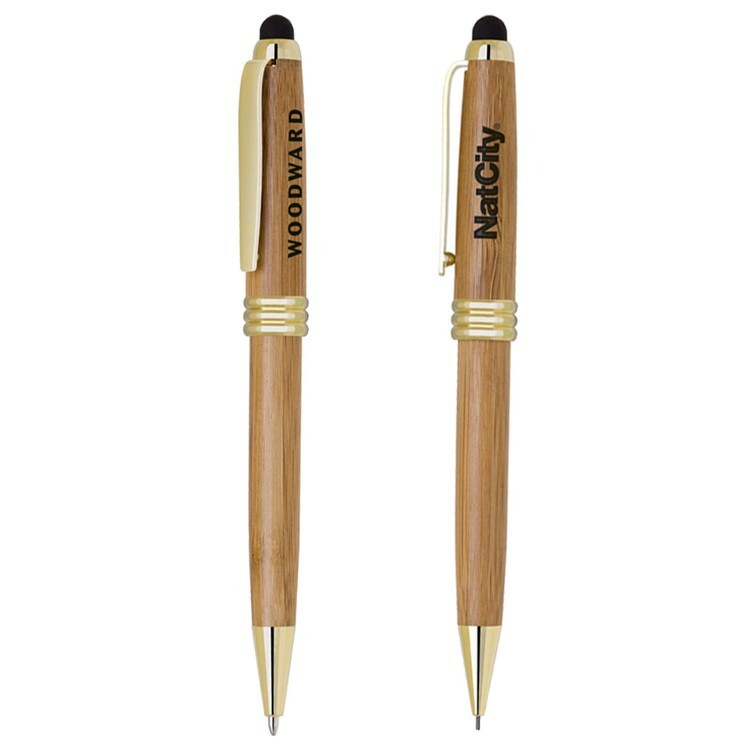 Eco-Friendly Bamboo stylus ballpoint pen with gold accents. 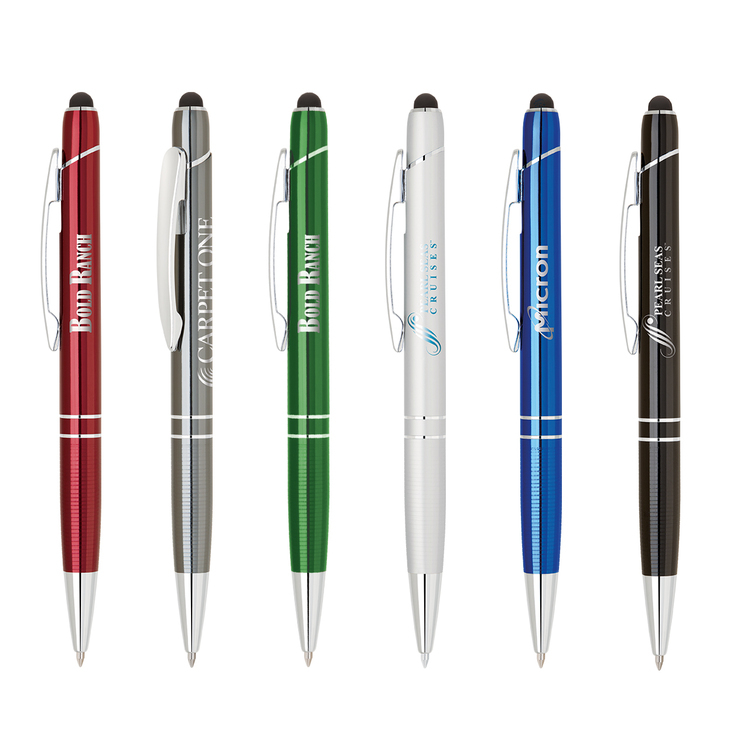 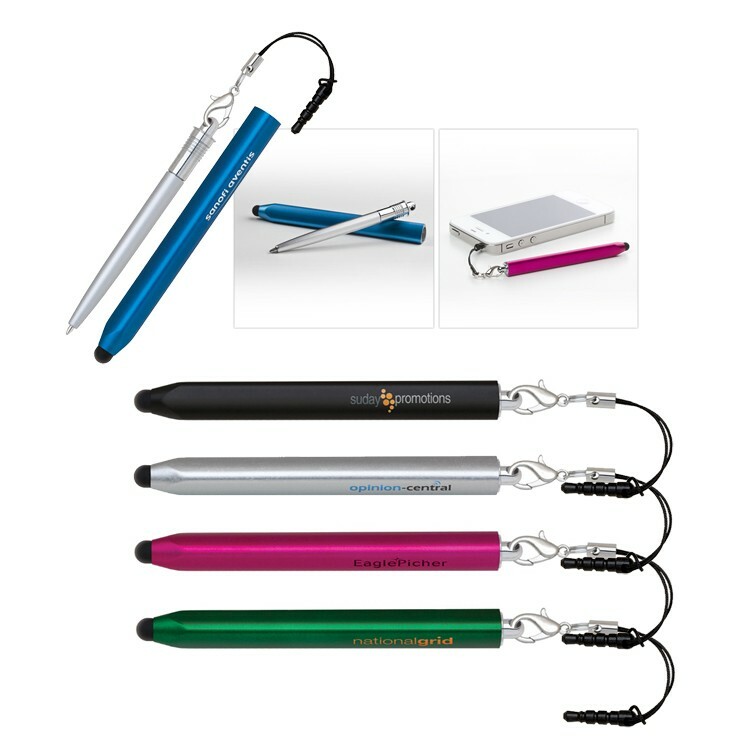 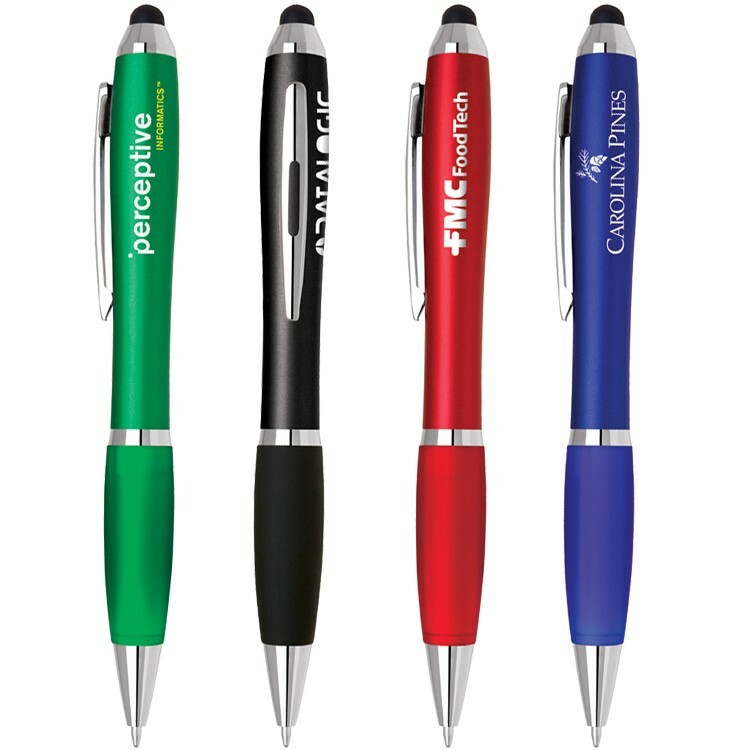 Features stylus for use on all capacitive touch screens (iPhone/HTC/Samsung). 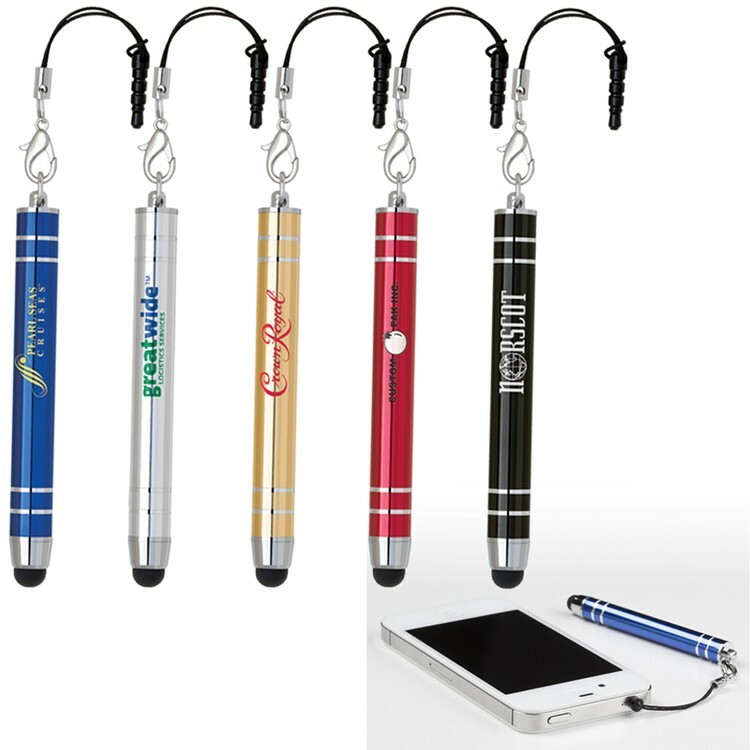 Beach Stylus with Twist Pen Twist action plastic stylus pen in bold color barrel and color matching grip Function design includes a capacitive soft touch stylus fully compatible with iPad, iPhone, iTouch, and all other touch screens Packed in a Polybag Price includes one color/ position Pad Print Comes in Black, Red, Green, Blue Each pen Stylus Combo comes in Gift Box Imprint Area: Pad Imprint: 3/8” H x 1-1/2” W FOB: 92821 500 pcs / 16 lbs. 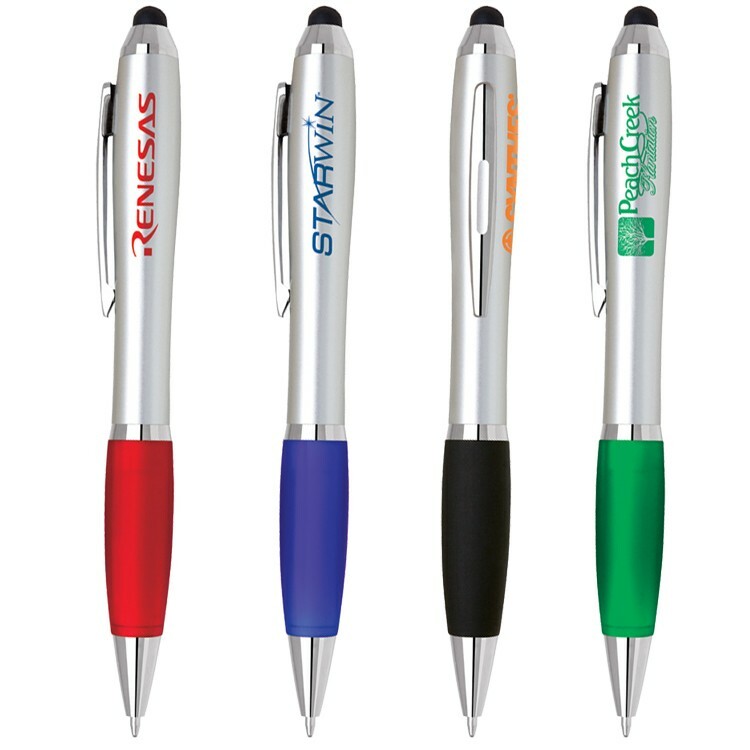 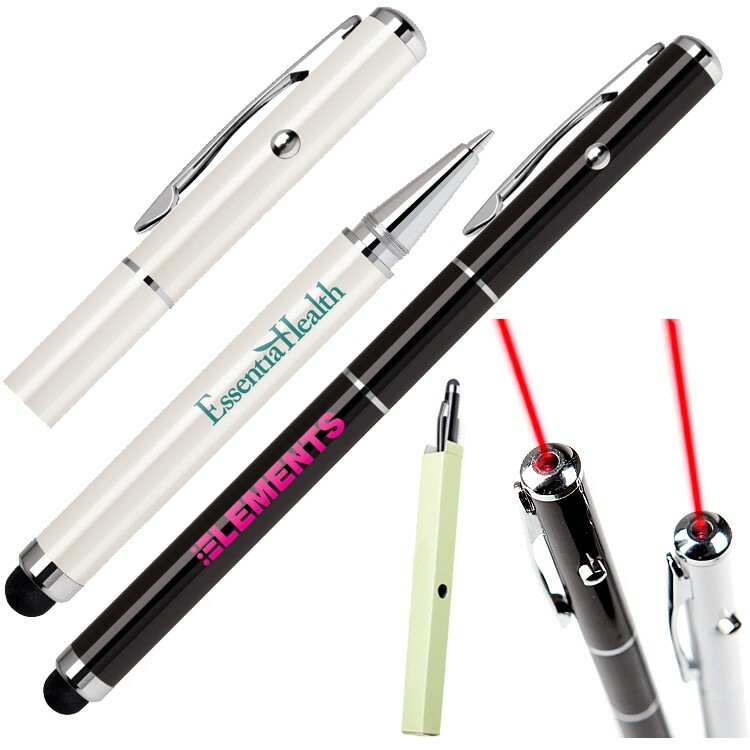 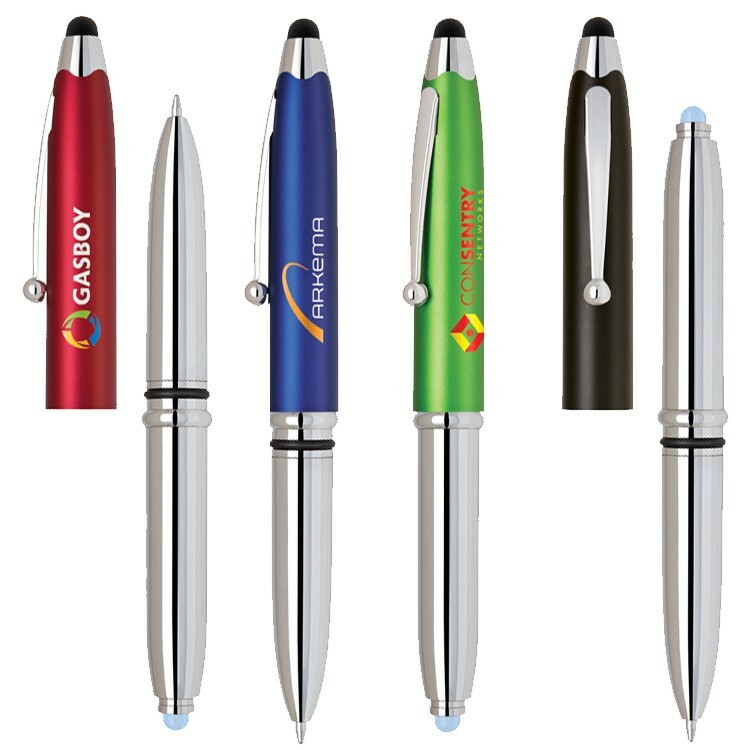 3 in 1 -Steve II Stylus with LED Light and Pen Cap-off 3 in 1 Pen - Stylus Tool - LED Flashlight 5" Long Plastic Body Ballpoint Pen Metallic and Matte Colors Bright L.E.D. 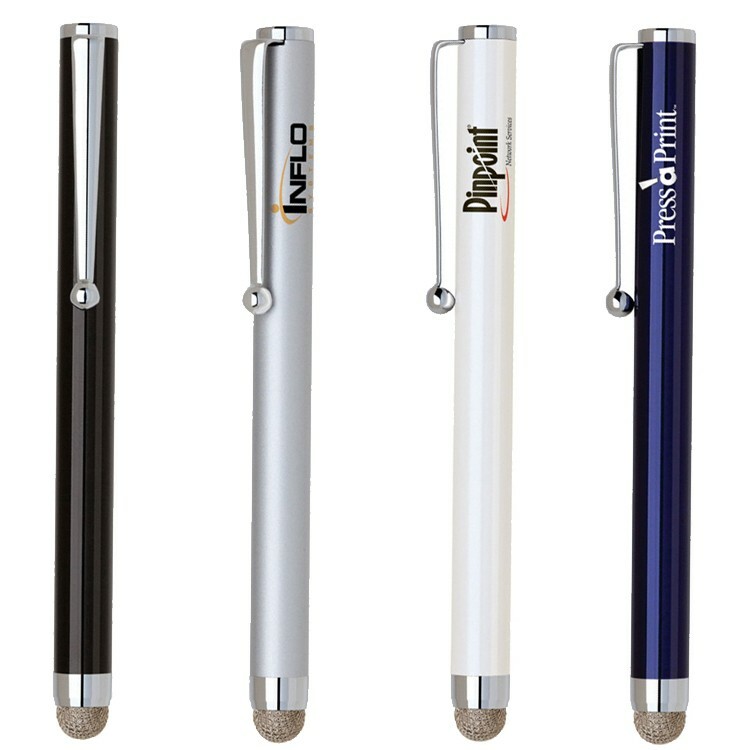 Light Function design includes a capacitive soft touch stylus fully compatible with iPad, iPhone, iTouch, and all other touch screens Price includes one color/ position silk screen or Pad Print Comes in Matte Black, Metallic Blue, Metallic Green, Metallic Red Imprint Area: Silkscreen: 1 3/16" H x 1 1/2” W - Cap Pad Print: 3/8" H x 1 1/2" W Standard Production: 5-10 Working Days from Proof Approval Rush Available FOB: 92821 500 pcs / 21 lbs. 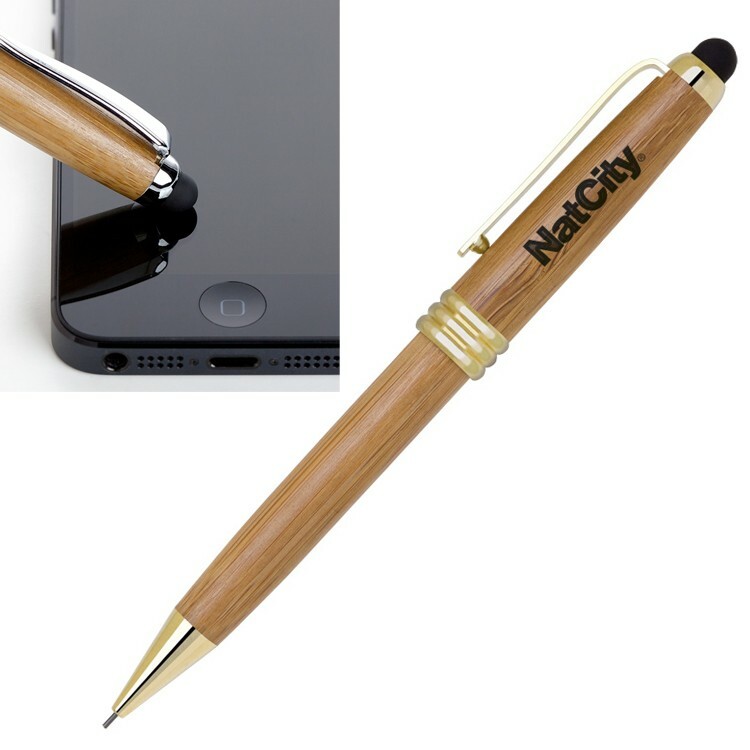 Stylus with Headphone Jack Adapter. 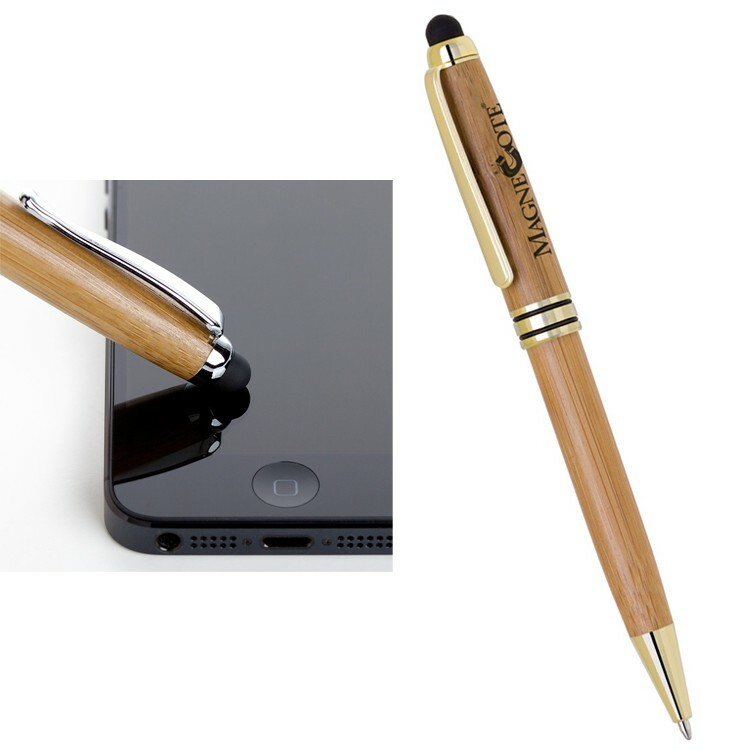 It features a capacitive soft-touch stylus tip that work with iPad, iPhone, iPod touch, and all touch screens. 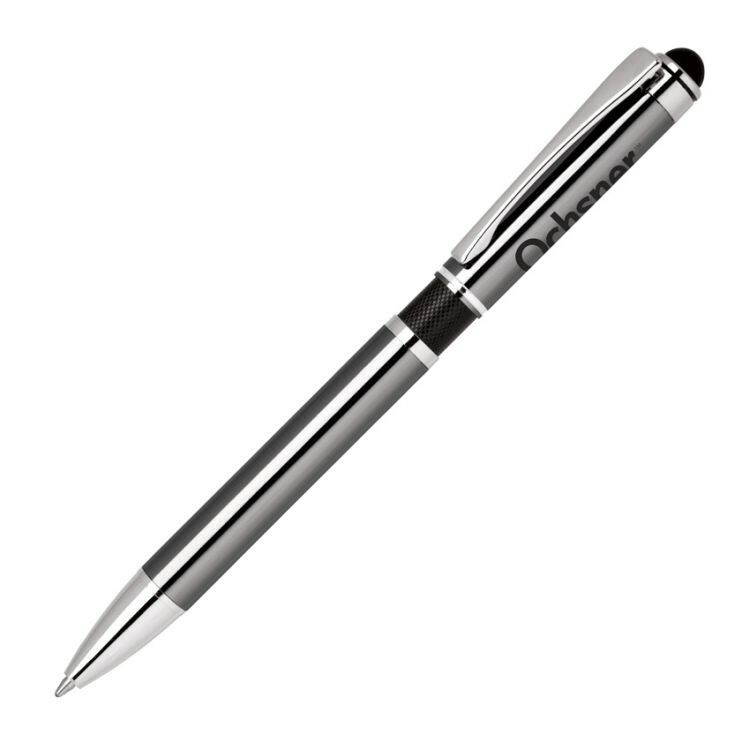 ***Production is 2 Full Weeks after order confirmation and Proof Approval*** If product is laser engraved, it will show a matte silver color as material is Aluminum. 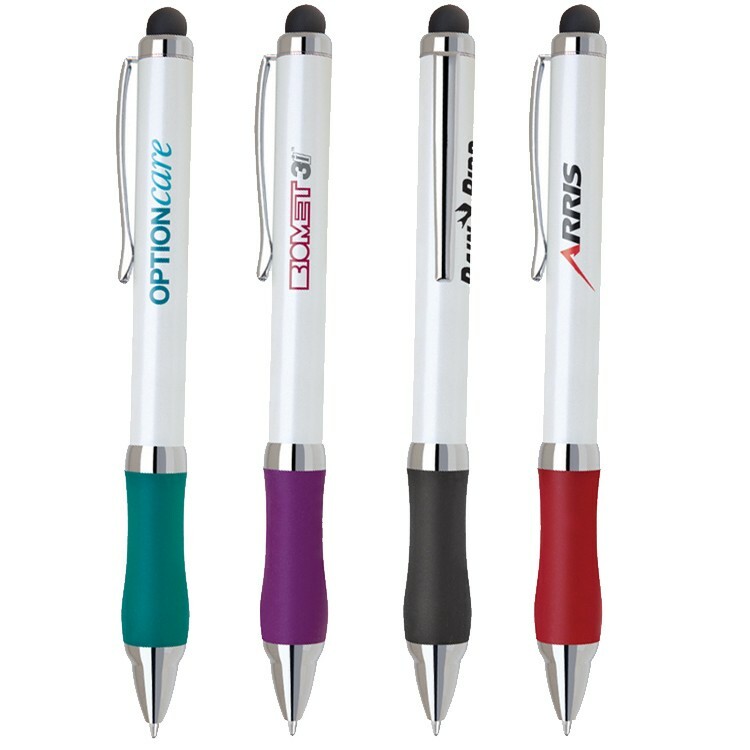 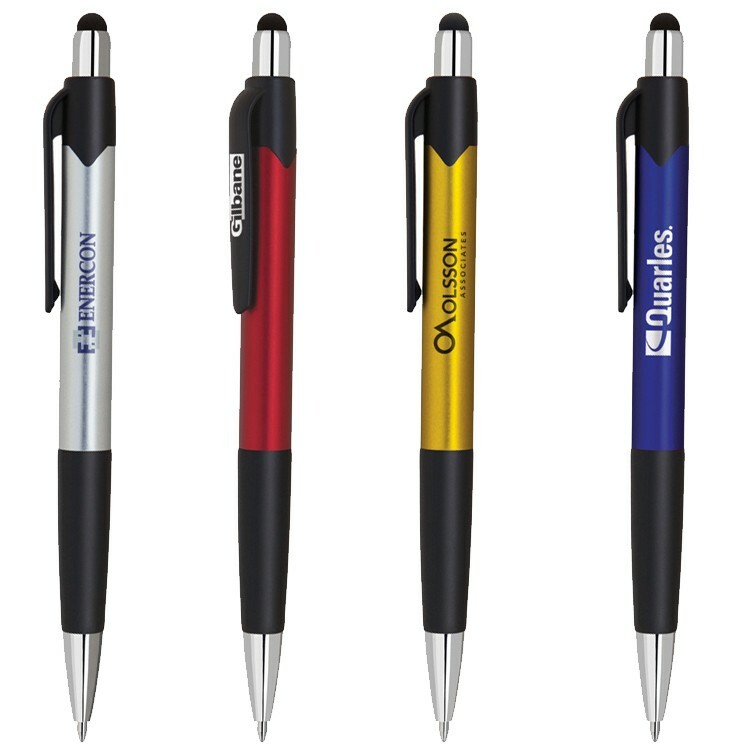 Flap II Stylus with Click Pen Click Action Plastic Stylus Pen Colored Barrel and Black Trim and Black Grip Function design includes a capacitive soft touch stylus fully compatible with iPad, iPhone, iTouch, and all other touch screens Price includes one color/ position Pad Print Additional Imprint Location: Add $0.20 (v) Plus Setup Comes in Red, Satin Gold, Blue, Satin Chrome Imprint Area: Pad Imprint: 1/4” H x 1-1/2” W (Barrel) 1/16” H x 1” W (Clip) FOB: 92821 500 pcs / 11 lbs.